Not too long ago, Allagash Brewing (Portland, ME) and Russian River Brewing (Santa Rosa, CA) created a very special collaboration with world renown Belgian brewery, Brasserie Cantillon. Wild Friendship Blend, born in Belgium, is a three way blend of 3 year old Cantillon Lambic, 2 1/2 year old Allagash Coolship, and 2 year old Russian River Sonambic. Sure to be a very limited release, is Allagash’s version of Wild Friendship Blend, brewed/blended again with beer from Cantillon and Russian River. All the breweries agreed that this special collaboration would only be poured at special events. 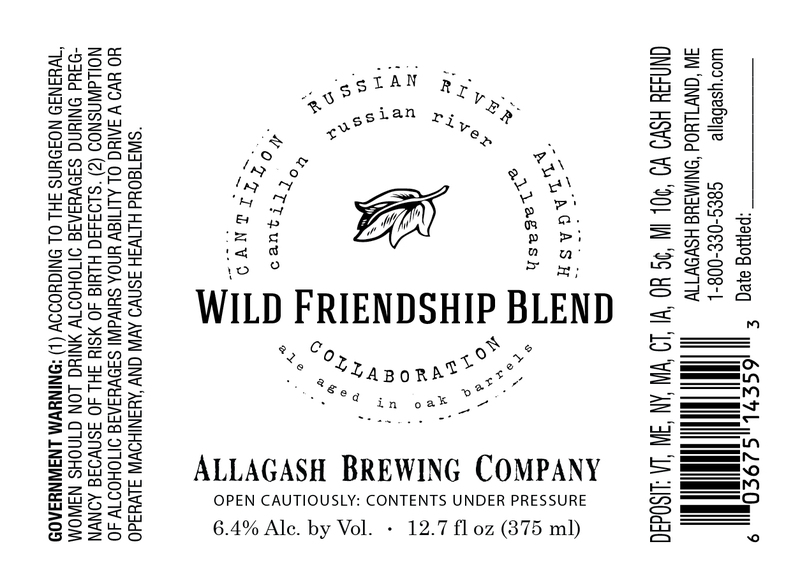 On Saturday, May 9, 2015, Allagash will host Wild Friendship Celebration, where Wild Friendship Blend will finally be served. Attendees of the Wild Friendship Celebration will get to taste this small-batch brew of which only 1500 bottles were produced. No bottles will be sold. Additionally, three other rare beers from each brewery will be offered. Brewery founders Jean Van Roy (Cantillon), Vinnie Cilurzo (Russian River), and Rob Tod (Allagash) will all be in attendance. “Full Plates Full Potential,” an initiative to end childhood hunger in Maine, will receive a portion of the proceeds from the Wild Friendship Celebration. Tickets will be available at WildFriendshipBlend.com starting on March 16 through March 23. Those wishing to attend can submit their email address for the random ticket selection process – 350 addresses will be randomly chosen to purchase two tickets. The event is Saturday, May 9 at Allagash Brewing Company in Portland, Maine. There will be two separate sessions: 1-4 pm and 5-8 pm. Tickets for this event are $100 (plus ticket service fees) and include a souvenir glass from the event. 350 tickets per session will be available, and sold through a random ticket selection process. Ticket buyers and attendees must be 21 years of age. Proof of age and tickets must be presented at the door at time of entry to the event. If you are selected to purchase a ticket, information on parking & transportation arrangements will be available at time of ticket purchase. It’s Zwanze Day. This is the brewery that is responsible. Because you can’t make it to Belgium, you can see it here. Courtesy of the Shelton Brothers. This Saturday is Cantillon’s Zwanze Day 2013. Every year the Zwanze beer is hand selected by the brewery’s Jean Van Roy. The base beer was brewed in March, 2012 and fermented in stainless steel for four weeks with a cultured yeast strain. After the four weeks, the beer was blended with 10% lambic and placed into oak barrels. Six months later, all the barrels were blended and put into casks to condition. Cantillon doesn’t consider this a sponanteously fermented beer (i.e. fermented with wild yeast) because of the cultured yeast in the beginning. However, Roy notes that there is enough wild yeast floating around the brewery and in the lambic to give the funky flavors people look for in Cantillon’s brews. A tiny handful of American bars receive the special kegs that will be tapped at 9pm Brussels time on September 14th. Stateside, kegs can be found here. Cantillion, one of the most sought after lambic brewers in the world might be changing things up a bit in the near future. Their lambics (sour wheat beer endemic to Brussels) have been aged in wooden barrels for years. Soon, you may partake in a Cantillion lambic from a new style of barrel – an amphora. Until recently I would have never even imagined myself putting my beer into anything besides a barrel, and yet… And yet, a blind wine tasting session completely changed my vision of things. On that occasion I tasted something which truly caused me to lose my composure. Its exceptional fragrance and finish, unbelievable complexity bringing together fruitiness, freshness and minerality made it incomparable with a “traditional” wine. There was clearly something different at work here, but what? Amphora. What’s that you might ask? It’s pictured below. An amphora was a vessel to carry liquid in the Mediterranean, and more notably the Roman Empire. It even became a unit of measurement by the Romans. There are a few winemakers these days that are using this pots to make natural wine, without the addition of extra yeast. The method of making these wines are similar to lambic making. Cantillion has recently acquired 12 of these vessels, soaked them in water, and filled them with lambic this month. First tastes of these amphora lambics will ready this fall. Thankfully, Gabrio Bini, an Italian winemaker, was present at the restaurant organising the event [the blind tasting] and I soon understood that he would be able to answer my numerous questions. Gabrio’s wines are produced in Sicily and matured in, wait for it, amphoras!